In 1980, we had metal contributions from Great Britain, the USA and Australia, so it would only be natural that we had at least one from Canada. Of course in this year of great rock and metal albums, there was a brilliant album from Rush, which I have already posted on, but since even they don’t want to be called heavy metal, I decided to honour their wishes and not refer to them as such. I’m digressing again, what Canada did give the metal world that year was a brilliant album from Triumph. 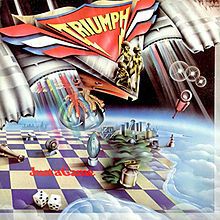 When I visited their “Just a Game” album during my tour of 1979, I explained that because heavy metal was still in it’s infancy back then, Triumph was still looking for the sound that would stamp them firmly onto the metal monument. I can now safely say that after hearing “Progressions of Power” twice, that they definitely found the sound they were looking for. For me, this is yet another great metal album from the year. Not only did the opener “I Live for the Weekend” had me banging my head away, but that lasted through the second song “I Can Survive.” Even the more power ballad “In the Night” didn’t lessen my happy mood. Then there were two great back to back rockers, “Nature’s Child” and “Women in Love” and I have to really sing the praises of “Tear the Roof Off.” That songs really gets me going even if it is followed by a total ballad in the form of “Take My Heart.” Finally “Hard Road” that takes the album to it’s conclusion in a very well done fashion. 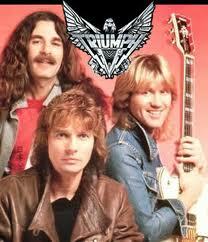 The problem that has always plagued Triumph is that because they’re Canadian, the get compared to Rush. Shame on those who do that. They are noticeably different. 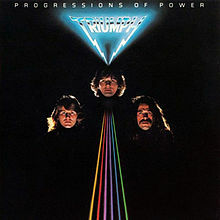 While Rush likes to go more progressive, Triumph lets you know that they are a hard rocking band and should be seen as such. I’m even going to go out on a limb here and say that I prefer the guitar playing of Rik Emmet to Alex Liefson but that’s just me. The solos he performs on this album are just grand. Way back when I first began this blog nearly three years ago, I said that Canadian metal doesn’t get the respect it deserves. I hope that as people follow me through this journey of heavy metal history, they will begin to give that respect to them. If you want a good place to start, then I can wholeheartedly suggest this album.